When my father gave me my first pack of baseball cards, he did so with pride…and directions. He took the opportunity to reminisce about his favorite players as a child and ultimately his own coming of age. He gave me that first pack with the sort of reverence that a king would knight someone. At the age of seven, I was unable to comprehend the significance of collecting baseball cards. I particularly didn’t understand the significance a few years later as less of my friends would collect baseball cards. If baseball cards were such a big deal to my father and other men his age, what happened with my generation? Why aren’t baseball cards as popular compared to the past? Why aren’t they as culturally and monetarily valuable? In cleaning out old belongings from my parents’ house, I decided to take a few baseball cards to a memorabilia store. I thought I could make a few extra dollars. From 1985 to roughly 1992, I collected over 5,000 baseball cards, and hundreds of basketball and football cards. I read each one from top-to-bottom and front-to-back. I knew all the brands of the time. I studied the hierarchy of commercial value for each brand. I often categorized my cards by team, or in order of star players to bench warmers, or based on brand, or by alphabetical order of team. Sometimes I would have sections of cards based on brand-designated categories like “Super Sluggers” or “Rising Stars.” Before I was a teenager, I thought I was mining a collection of gems to be sold or traded. I was seeking respect among other collectors (other children). My collection gave me pride. Because I took baseball card collecting very seriously, I studied other collections. To myself I would question the type of plastic sleeves that were used. I sought after specific binders for my cards. I developed an entire set of idiosyncrasies and neuroses, consciously and unconsciously, that were specific to the process and frequency of collecting. I didn’t collect or trade cards once in high school. Even still, I would occasionally count my cards page by page, read dozens of them, and re-organize them. Before walking into a sports memorabilia store some twenty years later, I remembered all of this. I remembered the exact system I developed in collecting. I even recalled specific trades I made. What I was told when I went into the store would help me realize that I was perhaps the last of a dying breed, the last generation of children with one hundred percent dedication to collecting baseball cards. I heard Mr. Johnson, the store manager’s explanation, but others have identified several factors that contributed to the comprehensive decline in the collection of baseball cards. You could blame the rapid changes of card publishing industry in the 1980s. Some of the blame has to do with the growth of activities available for children like interest in other sports, video games, and early computer games. Some have blamed part of the decline and near-disappearance of the culture on the happenings in baseball like steroids and fantasy baseball. What is certain is that I never knew card collecting changed until I had a brief conversation with a middle-aged gentleman who was barely getting any face-to-face business anymore. In the August 24, 2009 issue of Sports Illustrated, Luke Winn wrote an article titled "The Last Iconic Baseball Card." Winn credits the Upper Deck 1989 rookie card of Ken Griffey Jr. as the last baseball card of significant monetary and cultural value. Professional baseball has continued. Companies still print baseball cards today. So what happened? In 1952, the Topps Company began selling baseball cards. Until 1980, Topps was the only major company that consistently sold baseball cards. In 1975, Fleer, an occasional competitor of Topps, filed an antitrust suit against the company. Fleer claimed the exclusive contract Topps had with Major League Baseball limited competition. In his book, House Of Cards: Baseball Card Collecting and Popular Culture, author John Bloom states that between 1975 and 1980 the amount of “serious” collectors increased from 4,000 to 250,000, making baseball card collecting the fourth largest hobby in America. 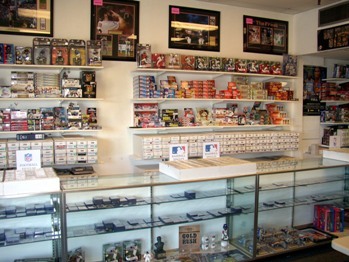 The number of annual baseball card collectible shows inflated from twenty to 600 during this period. Part of this expansion has to do with Baby Boomers who collected cards as children. Several of them passed down this tradition to Generation X, multiplying the market of collectors. In 1980, Fleer won their case. While Topps won the right to be the only card company to market cards with candy or gum, the ruling led to the start of several other companies between 1980 and 1989, Winn’s year of the baseball card apocalypse. If the Griffey Jr. card timestamps the end of an era for baseball cards, then perhaps Griffey himself represents a transition in baseball as well; a transition in the connection between the baseball fan and the baseball card collector. Griffey Jr. was an athletic prodigy and the child of former major leaguer Ken Griffey Sr. Griffey Sr. was a part of the “Big Red Machine,” the popular Cincinnati Reds championship teams of the early 1970s. For many, “Junior”, as he was often called, resonated with many younger fans at the time of his arrival in the major leagues. Nicknamed “The Kid," Griffey had a different look, style, and way of playing baseball than other star players. His game and demeanor were reminiscent of Willie Mays, but his style was contemporary. He often wore his cap backwards, wore earrings, smiled often, and was known for his spectacular home run-saving catches. Griffey was one the first ready-made, ESPN SportsCenter baseball players. He had a swing of the bat that often made commentators and analysts swoon. His contemporary, Barry Bonds, was also the child of a major leaguer, a left-handed slugger, and exceptional all-around player. His public image was not, however, as friendly. For many baseball fans and card collectors of the last twenty-five years, Griffey is considered that last “clean” baseball superstar. Nearly all of his contemporaries have been accused of steroid use. But Griffey represents a link to the past, a link to a time when the innocence of baseball card collecting coincided with the innocent lens constructed to watch baseball players play. In 1994, five years after the debut of Griffey and Upper Deck, Major League Baseball players went on strike. After Griffey’s first year, the effects of various cultural movements would win over many who would likely become baseball card collectors in a different time. Baseball card collectors have always intersected with other defined demographics or cultures. Perhaps the interest in collecting, traditionally cultivated in youth, declined simply due to competition outside of direct business competitors. While more and more children and adults were collecting baseball cards between 1980 and 1989, A few landmark movements in American popular culture began. In 1984, the National Basketball Association appointed a new commissioner, David Stern. Stern would revolutionize the branding of basketball for decades to come. In the 1984 NBA draft with Stern at the helm, a player who would change basketball and the marketing of sports apparel was drafted - Michael Jordan. This diverted eyes away from baseball, and baseball cards. No longer did little boys want to be their dad. Many wanted to “Be Like Mike” as the 1992 Gatorade jingle goes. In 1986, a Japanese consumer electronics company would introduce Americans to a product that would also provide more choices for youth activity - the Nintendo Entertainment System. More than the company’s competition, Nintendo popularized gaming as a leisure culture. How powerful would they become? Nintendo is the current majority owner of the Seattle Mariners, the team that drafted Ken Griffey Jr. over twenty years ago.